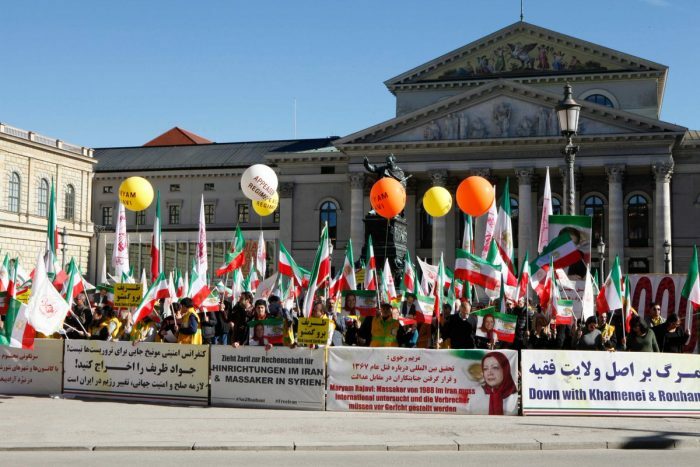 MEK Supporters rally in Munich amid the Munich Security Conference-2019, to protest Javad Zarif, the Iranian dictatorship’s Foreign Minister’s invitation to the conference. 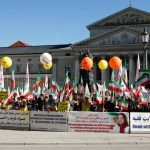 On Sunday, MEK supporters held a rally outside of the Munich Security Conference in Germany to protest regime Foreign Minister Javad Zarif’s presence at the conference. The protesters called for Zarif to be expelled from the conference and for an end to the policy of appeasement toward the mullahs’ regime. MEK supporters also carried a banner reading, “Munich Security Conference is no Place for Terrorists: Kick Javad Zarif Out! World Peace & Security Requires Regime Change in Iran,” and “Down with Khamenei and Rouhani.” Other protesters held banners proclaiming that Iran as the number one state sponsor of terrorism and the primary cause of instability in the region. In June 2018, an Iranian couple was arrested in Belgium with 500 grams of TATP explosives en route to the annual gathering of the Iranian Resistance in Paris, which was attended by tens of thousands of MEK members, as well as dozens of high-ranking international lawmakers and dignitaries, many of whom later filed lawsuits against the Iranian regime for the attempted attack on their lives. German authorities arrested Iranian regime diplomat Assadollah Assadi later that day for personally delivering the explosives to the couple. Assadi is currently standing trial in Belgium for masterminding the terrorist plot. An investigation by French intelligence later concluded “without any doubt” that the attack had been orchestrated by the regime’s Ministry of Intelligence and Security. In January of this year, the European Union sanctioned the MOIS and two of its agents for their role in some of the regime’s terrorist plots against the MEK on European soil in 2018. The MEK has called on the European Union to close the Iranian regime’s embassies and expel agents of the MOIS and the Quds Force. It has also asked for the United States and the E.U. to add the MOIS and the Islamic Revolutionary Guards Corps (IRGC) to their terrorist lists. The MEK protesters objected to Zarif’s presence at the conference because, as a member of the regime’s Supreme National Security Council, he has played a key role in the regime’s acts of terrorism. In November 2018, Zarif told the regime’s Parliament that he takes orders directly from regime Supreme Leader Ali Khamenei: “We are not a system in which people can act on their own,” he said. “We cannot do anything in this country without having to report it. … It is not true that we acted against the will of the Supreme Leader,” Zarif said in comments carried on State television. The MEK protesters in Munich asked the participants at the Security Conference to take action against the Iranian regime for its terrorist activities. They also urged the international community to recognize the right of the Iranian people to overthrow the mullahs’ theocratic regime and create a free Iran.